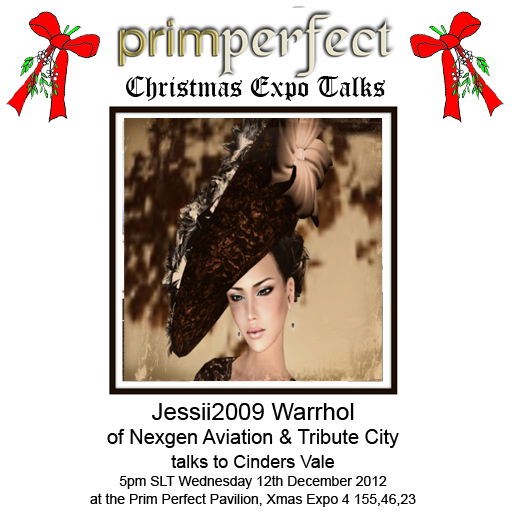 Today the talks in the gorgeous Prim Perfect Pavilion are at 3pm, when Saffia Widdershins will be talking to Rosamoo Mendelsohn and Xia Nishi of Hunt SL, and Cinder Vales will be talking at 5pm to Jessii2009 Warrhol of Nexgen Aviation and Tribute City. Hunting is a major area of Second Life – combining socialising, gaming and shopping – all three core activities in Second Life! 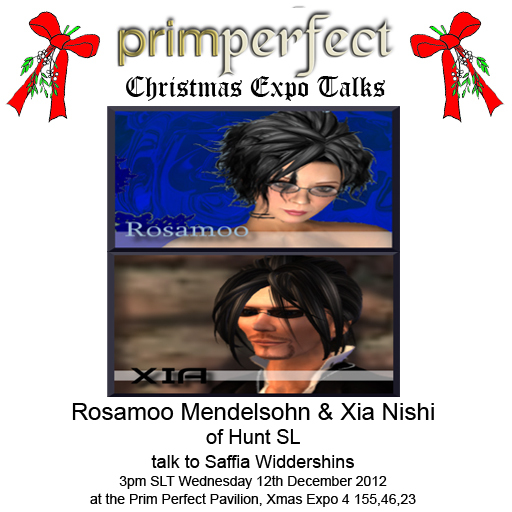 Rosamoo and Xia will talk about running their impressive hunt blog, about hunts and hunting in Second Life, and perhaps they’ll even have a few tips to share! Jessi has worked with the Flying Tigers and the aircraft maker that supports the creation of vintage aircraft (and some modern planes as well – Nexgen Aviation. She’ll be talking about that and her work with Tribute City too. We have a full programme of talks coming up at the Expo – make sure that you don’t miss them! And please note that there have been a couple of recent changes … including one “back by popular demand”.